We were established in 1977 as a manufacturing and trading company. The concept of SecuriTape was born as a result of necessity, as nothing was available in the line of security tapes at an affordable cost. We have since exhibited the product at national and international packaging exhibitions, namely Propack S.A. and Interpack Dusseldorf, Germany and have recieved recognition for its innovative concept and great interest from the trade and end users alike. Any regular packaging tape, clear or coloured, can be transformed into a security / tamper evident sealing tape by using it via the PrintWiz STS (SecuriTape System). 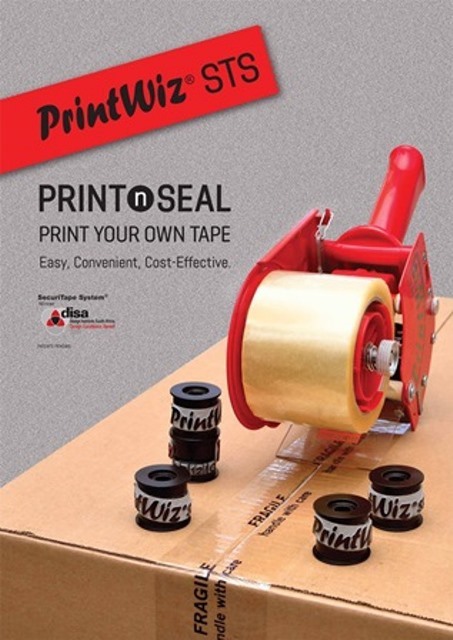 For further enhancement of tape security a patented concept of pre-printed, SESURITAPE , has been designed to work hand in glove with PrintWiz STS. The security information is printed with unique message set by the user, become an integrated security tape. The tape is avaliable in a number of standard SecuriTape designs for customers that prefer anonymity. Alternatively it can be customized for those who prefer using their own corporate idenitity ie; their company logo, company information, etc. Widths vary from 48mm to 75mm. For best results we strongly recommend the use of 72 mm tapes. This video demonstrates application and general use of the PrintWiz STS. Membership requiered Apply Here On approval the link will be sent to you. Your choice of SECURITY TAPE is a critical decision in the overall effectiveness of your loss prevention program. What are your options ??? Security / tamper evident tape that leave residue "void" stop open when lifted, is good but very costly and therefore commercially non viable except in very few applications. In the past, for lack of choice, the most commonly used tape for security, was a pre-printed packaging tape. Being easily obtainable from your own premises, as it is a regular stock item, it could be re-used to conceal the violation, therefore it can not be considered a security tape. Now you do have a choice! With the introduction of PrintWiz STS, a continued development of SecuriTape System, an exciting and affordable option of real security tape become available. Managing and controlling the security aspect of the system. PrintWiz STS, SecuriTape System meets the most demanding specifications, at an extremely competitive price. .
For your protection please evaluate and compare the security features of our PrintWiz STS, with your other alternatives. Easy to operate, cost effective, versatile, with multitude of security levels. The ability to add or change text at will, makes it very desirable product for any one with concerns regarding carton sealing and security awareness. Even in its simplest form, this system will transforms the very basic tape, to a security tape, by printing your security features yourself, onto the tape, only at the time when sealing the carton, therefore, puts our SecuriTape System at a huge advantage over the other, off the shelf products. The ability of changing information at any given time, on a specially designed printing wheel, is another GREAT SECURITY and ADDED INFORMATION feature. Imagine, a multi national company with multiple branches, using its corporate printed tape in all its branches or locations, now are able to control and detect the origin of goods, as each location will print its own signature onto the tape, on application. The result, HIGH LEVEL SECURITY IS ACHEAVED, AT A VERY LOW COST. In conclusion. simplicity of our PrintWiz STS (SecuriTape System) together with cost effectiveness, gives the user an affordable solution and greater peace of mind to an increasingly growing problem.